This will be a useful guide with tips and tricks to bring your business to the web 2.0, because this is hard work but is also fun. The first mistake many business owners make is to think their business must be in every social network. It’s a terrible mistake. Every business has their own specifications, therefore some platforms will be more suitable than others. There is no point to be everywhere if you’re not really there. I mean, you can only bring your business to a handful of platforms if you have the structure to keep them updated and to find your target on each network. So, choosing which network to be will mainly depend on which type of business you have. For instance, if you design jewelry or furniture, maybe Instagram will be the one for you, but if you have a bar or a restaurant, possibly Facebook will be more suitable. It’s not a bad idea to combine a couple, you just need to understand if you have the time and resources to manage them. This first step is crucial and you need to put a lot of thought on it, this will be the first and far most important step to take on this exciting journey. This may seem rather complex, but this second step is also very important. Before you even create any sort of Social Page you must think thoroughly what you want to achieve and how you want to do it. Put your thoughts on your company, your clients and what sort of connection you what to have with them. Is your company formal? Are you prepared to share your company’s “guts”? Can you take a bad review? Will your go mad with a nasty comment? These are some sort of questions you need to be ready to answer and to be ready to deal with. The type of communication that you now have will somehow shape your company’s image. The online presence is something that people now give a lot of importance and on which people rely a lot. A common mistake that people think they will achieve with the web 2.0 is that it will bring them a lot of new clients and revenue so they use the Social Networks to SELL. If you open a Facebook page to promote your services or products every day you are doing it wrongly and you soon will get very frustrated with the lack of success. People use the social networks because they want to have fun and they want to relax. Ok, they are happy to know that you offer 20% discount on your products if you “Like” their page, but they seek more than that. They seek your company´s intimacy, they want to be surprised, to see funny pictures, funny videos and above anything else they don’t want to feel pressured to buy what you sell. Most of the Social Media networks are used by people to relax, so make sure you do not sell constantly your products but sell them indirectly by using Content Marketing. A small but big mistake that I see often on very social networks, especially on Facebook, is the lack of care with the visual image. The first thing that catches our eye when we visit a page is the visual impact that it creates on us. I regularly see pictures with low resolution or images that do not represent the company´s profile. In this point you must often use your common sense, choosing quality content. You may not be a creative or a Graphic Designer so choosing your visual content can be sometimes hard. Is fundamental that you have your company´s logo on your landing page and that can it be seen properly. If you are using Facebook or Twitter make sure you use a Cover picture with a right amount of pixels in order that it can be shown with a good quality. You can use Canva to play around with images and to create good visual content. Make sure you read their blog since they share amazing tips about Fonts and Visual Content. If you need to edit your photos or make some changes you can download Picasa, it´s from Google, it´s free and it´s a good alternative to the complex Photoshop. Do you know that Pinterest is and excellent network to get amazing pictures? Its a great alternative to Google Images. If you are using Instagram take a look on these useful tools. Have a look on more examples for Facebook pages here. Everybody wants likes, followers, comments and shares but many fail to know how. The answer is simple, yet the way to accomplish it not so much. Engagement is the key to earn kudos amongst your fans or followers which means that your main goal is to make sure that the users interact with your page. You can do this by publishing valuable content and create some sort of interest on people. This concept is not hard to understand but it is rather difficult to put it into practise. As I explained on the third point, you shouldn’t use Social Media to sell directly your products but to share valuable content. In order to do this you must understand your audience and publish content that might meet their needs of engagement. You must know what type of content your followers will want to share, to comment and like. It´s the hardest part of Social Media and it´s even harder if you have a small business with an unknown brand. To do this effectively, you must study hard your competitors and other companies to understand what sort of ideas you might start to use. Follow pages on Facebook and Instagram to get some ideas, Search for content on Google and be creative. 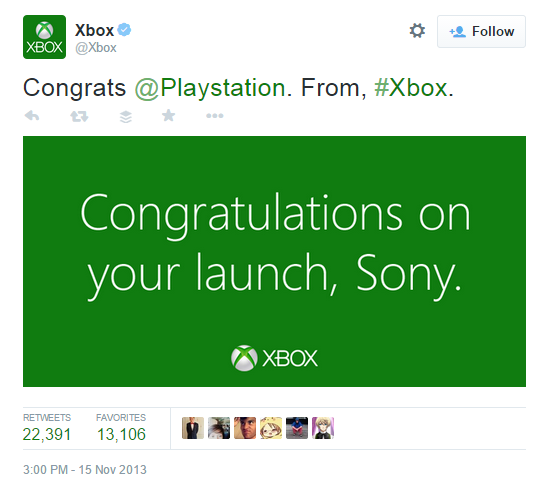 Here´s an example of good Engagement with followers. 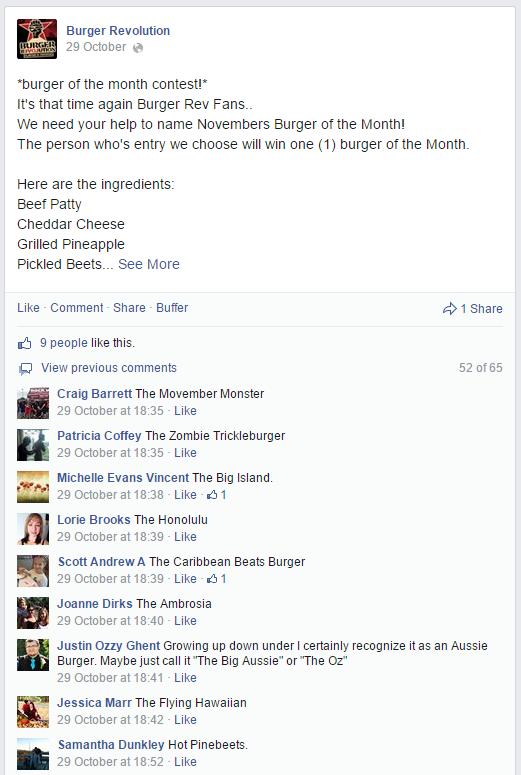 This Burger Restaurant called Burger Revolution is a small business with around 3300 fans on Facebook. By creating a small contest their followers got excited to give their idea for a burger´s name and this post generated 65 comments, which is quite a lot for this size of Page. If you want to read more on how to Engage your fans, you can have a look on these 16 Tips. 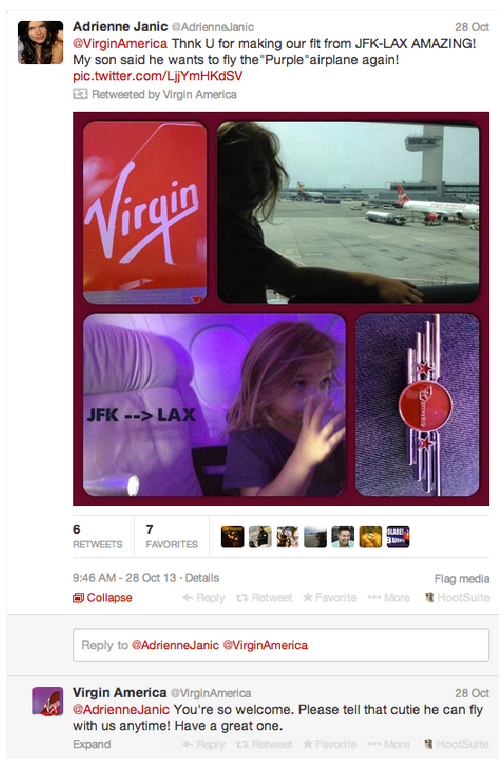 Other thing that needs to be thought is who’s going to manage your Business’ Social Media. This can be more tricky than you might think. Many of the small business ask a friend, a relative or a girlfriend to manage their pages. This can be a huge disaster. Whoever manages your social media must know what to do, must be consistent and needs to be on top of what’s happening within your company which may not be accomplished by someone external to the company. Make sure you decide wisely who’s that person and if that person is likely to be qualified to do it. You need to trust his or her decisions a give a lot of freedom since this is a world that moves fast and can’t be waiting to be reviewed and overanalyzed. If you can’t afford to pay someone to do it, maybe it’s wise to invest some time on getting someone within the company to get the know-how. If you are the CEO and if it’s you taking that responsibility, make sure you have time to do it, there’s nothing more sad than an abandoned social media Page and that can damage your company’s image. Not long ago, Swedish Pepsi messed up big time on their Social Media. They tried to be funny and created a monster after posting the picture below against Cristiano Ronaldo due to the World Cup Qualifier matches. 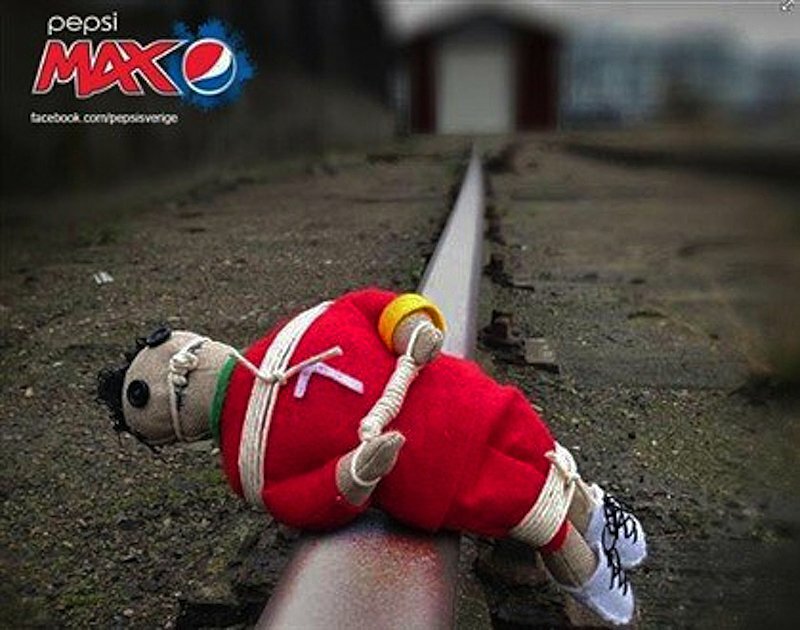 This picture generated a lot of very negative comments and bad feedback to Pepsi and led to a creation of an Anti-Pepsi Page on Facebook which generated more than 100k Likes in one day. Pepsi was forced to apologize and a lot of Portuguese fans stopped buying the drink and many establishments refused to sell it. Too much of bad publicity that was easily avoidable. What to learn with this? Make sure you trust on whose publishing on your company’s behalf and that that person has a huge dose of common sense. For some reason, in many occasions people use social media as a if it was their personal shrink and they tend to post about their problems, concerns and whatever bothers them. There is no point to do it with your Business’ page. Complaining, moaning and generating negative comments will bring nothing but bad publicity. Use the web 2.0 to share knowledge and positivity. Amy Baking Company is an example how negativity may bring your business down. This was a restaurant that became insanely famous on a TV show with Chef Gordon Ramsay. This restaurant was getting a lot of negative reviews on the internet on platforms like Yelp and Reddit and the owners seemed to uncomprehend why since they were convinced their food was great. After a terrible exposure on the show, this is how they reacted. An example not to follow. One of the things that I see many people getting afraid of before creating a Social Media page for their business is the bad publicity it might bring on. With this I mean, bad reviews or bad comments a user may drop on your page. This is something that you need to be aware that can happen, and you need to be ready to deal with it. I had recently a terrible experience with a brand that I really liked that made give up on them. After this brand posted on Facebook a very negative post about one of their partners I made a comment trying to positively turning around that post as many others were doing as well. You need to know that customer might not be always right, but you need to make them feel they are and with the amount of visibility a social media page has you need to know how to deal with it and to be ready to do it at any time. Sometimes you might be required to check Social Media 24/7 since you never know what might be happening while you’re away. 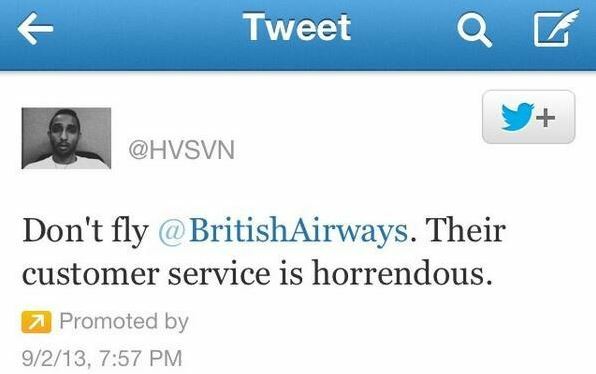 Below, a famous case of a very upset customer that bought Twitter ads to complain about bad customer service from the airline British Airways. Follow your competitors will bring a lot of advantages. In order that you can have a strong online presence is important to see what your competitors are doing and even, if you dare, to interact with them. 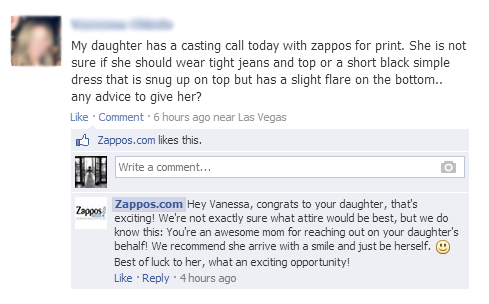 Is for sure a plus if you positively comment on competitors’ posts. It will reinforce your online image and gain kudos from your followers and even possibly gain new others. It’s not easy to have a close online relationship with competitors, especially if the one offline is not great, but if you manage to do it you certainly gain a lot of points from your community. Would you expect to see something like this? If they can do it so can your business. Your fans and clients are the reason why your business exists, many business do not understand that this must be a two way relationship. Meaning that you need to take care of your clients, and with Social Media you have a good platform to do this. Take sometime to like, comment and share their posts. You will certainly get a lot of respect and excitement from your followers, this will generate more engagement and more connection with your brand. The best posture to have on Social Media is to be casual and not very formal, this is the key posture on these sort of platforms. If you keep same type of communication that you have in the real business world, you not going to succeed on Social Media. This is because people want that the company they like connects with them and talk to them directly, and not with a corporate and professional posture. If you have a small business you are more likely to be able to have this sort of informal communication, take advantage of it! 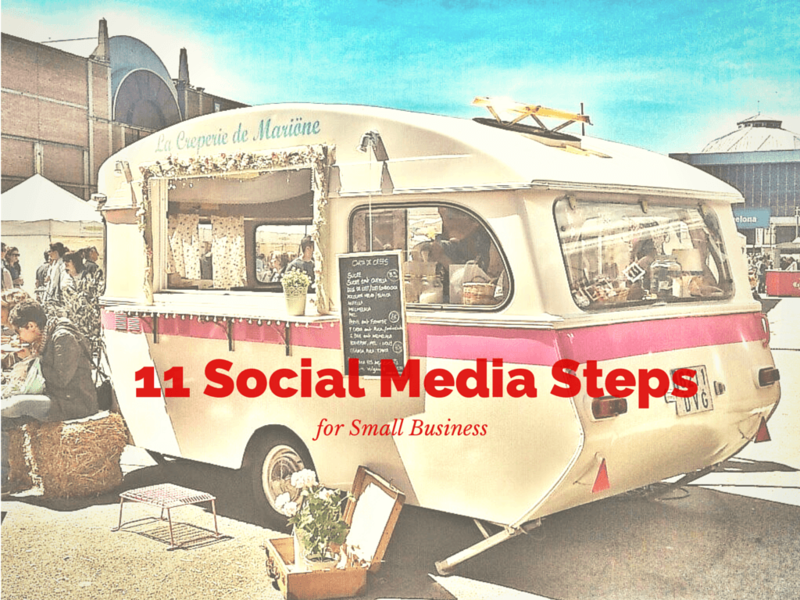 Bringing a small business to Social Media is never easy, but as you can see there are a few things that you can take advantage from being small. Being freer and not very attached to any strings coming from a strict board room is great plus. You will be able to properly shape your online presence. Be funny, be creative, share knowledge and positively interact and engage with your fans. If you follow these rules, likely you will be successful on social media. Share your thoughts! Have you managed Social Media for your business? After this reading, are you ready manage your Social Media yourself? Would you add any other fundamental step? Si así es, de verdad que en mi caso me serán de gran utilidad! Gracias por compartir tu experiencia con la comunidad. Saludos desde Mexicali, B.C. De nada Sheila, a ver si mejoras y les hechas un ojo que son muy buenos! You seem to have cracked the code! Great tips! Keep it up! Thank you very much for reading and sharing it on Twitter. Happy to know that you’ve liked it. Have a nice day! Thanks so much for this! Such an informative read.